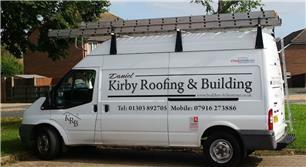 Kirby Roofing and Building Contractors - Builder, Roofer based in Hawkinge, Kent. Roofing and building in the Folkestone, Dover and surrounding village area. Large and small jobs welcome. Over 25 years experience covering all aspects of Roofing and Building, from new roofs flat roofs chimney rebuilds to repairs and renovation work. Free Consultation Visit: No pressure sale: We visit you at your home and within 7 days you will receive a full build specification quotation. Folkestone, Dover,and surrounding villages in Kent.